Nothing beats a a good cup of coffee in the morning… unless it’s paired with a slice of warm banana bread! After a crazy buys weekend running around Chicago (literally! ), I took Monday off from work to relax and recover. I also found that I had a pile of banana’s that had gone uneaten over the weekend while I was gone. Some were chopped up and put in the freezer, along with some blueberries, to be used later in smoothies. A few were destined to become banana bread. 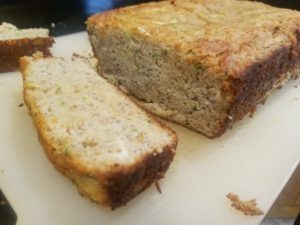 Just by chance, I also had some zucchini that I received in my summer CSA crate last week, so I was on a mission to find a recipe for a Gluten Free recipe to utilize what I had. Before long, this is what I found! Gluten Free Zucchini Banana Bread and I actually had all of the ingredients on hand (that rarely happens in this house!). Instead of regular flour, this recipe uses coconut four, which I love baking with! I did have to make a few modifications to the original recipe so that I could actually enjoy it (cashew butter in place of almond butter) but these were minimal. After some quick shredded and mashing, I had a pan full of yummines that was headed for the oven! We found a winner with this one! Moist and full of flavor – no one else even could tell that it was GF! The only thing I will probably do next time is to bake it a little longer. I prefer my banana bread to be a little crunchier on the edges! Now time to grab a cup of coffee and a few slices to enjoy before the last of it is gone!